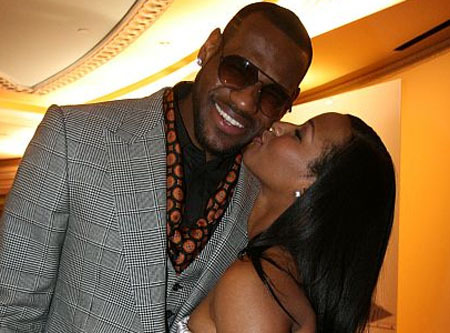 The new year is already off to a hot start for Miami Heat forward LeBron James, who rang in 2012 by proposing to longtime girlfriend Savannah Brinson at his 27th birthday party Saturday night in Miami. Brinson and James are high-school sweethearts, dating back to James’ days as a standout at St. Vincent-St. Mary High School in Akron, Ohio. Brinson is the mother of LeBron’s two kids, LeBron, Jr., 7, and Bryce, 4. In photos from the event, LeBron can be seen wearing a black tuxedo with a bowtie and black glasses, and Brinson is wearing a black dress. James isn’t the first member of the Big Three to put a ring on it in 2011. Chris Bosh married Adrienne Williams in June at an extravagant wedding at Miami’s Fontainebleau Hotel — an event that required the NBA to make an exception allowing team executives and players to mingle during the lockout.